The 34.01m motor yacht Helena, listed for sale at Edmiston & Company, has been sold with Exocet Marine introducing the buyer. 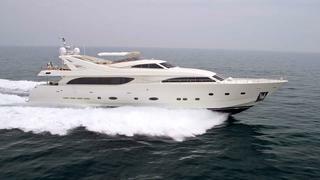 Helena was delivered in 2004 as hull number eight of the Ferretti Group’s 112 Custom Line range and upgraded in 2010 and 2014. Designed by Zuccon International, she is RINA classed and sleeps up to 12 guests in an owner’s suite on the main deck, two VIP staterooms and two twin cabins plus two Pullman berths. In addition, there are quarters for five crew. A notable feature is large windows from the bow to stern, flooding the saloon and master suite with light. A large and comfortable saloon, with paneling in American walnut, has a lounge area with ample seating on settees arranged in a U-shape, a bar and an entertainment centre including a satellite television screen, while forward is a dining area with seating for 10 guests around a glass-topped table. Twin 2775hp MTU diesel engines give her a cruising speed of 23 knots topping out at 26 knots and she is fitted with Trac digital fin zero speed stabilizers for anti roll comfort at sea and in port. Helena was asking €3.8 million.